The Basketball program at Southeastern Baptist College was surprised by a gift from a Mississippi Church recently. 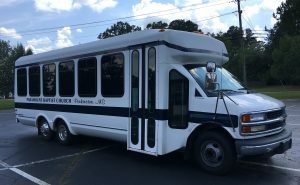 The donation of a 30 passenger bus to the Athletics Department by Paramount Baptist Church was a huge blessing. The church then delivered the bus to campus from their hometown of Perkinston, MS. “We are so grateful for their generosity and the support they have shown our program. It’s all about the kids, knowing that they have the support of the community means a great deal,” stated Athletic Director and Head Coach Brad Phillips. Reviving the Chargers Basketball program is the first step in bringing athletics to Southeastern again. The interest in the new SBC Chargers teams has been huge! So much so, that we now have two men’s basketball teams. Teams are divided into Women’s Varsity, Men’s Varsity and Men’s Junior Varsity.